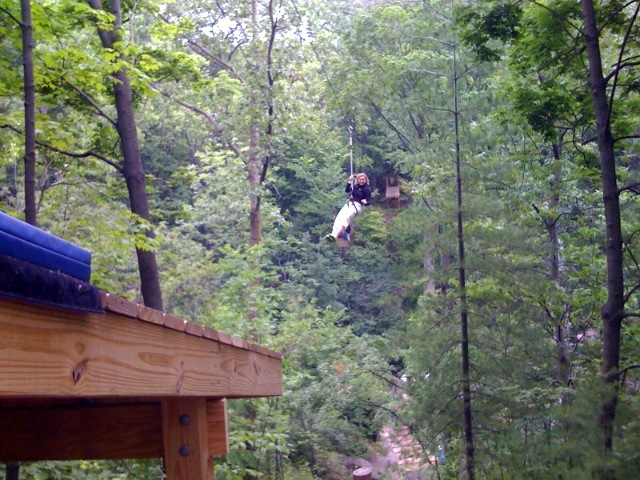 This is me on a short zip line at a local zoo a few years ago. I’m always acting like a kid. This is an update on my workouts. As the trainer: If you remember a few weeks back I offered to train a couple of friends one day a week for 12 weeks. So far we have met 5 times and of those A has missed 2. That is a little disappointing, but I’m just encouraging her to do her best. C has been so dedicated, I can definitely see changes in her mindset in just these few short weeks. She is working out on her own other times during the week, even working out with another friend. I am really hoping that A can get back that enthusiasm she had at the beginning of all this. I’m trying to not let this get me discouraged because I know she would be so happy with herself if she could just get past this hump. As the trainee: My gym was offering a deal on personal training 5 sessions for a low price. I have had 2 sessions and they have both seriously been worth every penny! The trainer is really good at picking appropriate exercises and getting my heart pounding. The first day we did these bench hops and I was out of breath in a quick hurry. Hey, I’m a runner, I’m supposed to have good cardio?!? I guess I haven’t been pushing myself enough. Gotta mix it up! Then this week was arms and so many push ups and pull ups (on a low bar, not full pull ups, I’m not there….yet!) my arms were beet red! She said that was a good sign, I was thinking, What is wrong with me? It has been such a nice treat to just let someone else tell me what to do and the time passes so quickly. I think I may reward myself with another few session later in the year, if I can find the $ in the budget. I’ve been running on my own, this month I set a low goal of 30 miles and I am more than 1/2 way there. Yay! Gotta love it!